I don’t have much of a sweet tooth. I’m more of a carb person. But I do crave sweet stuff occasionally. When I do, I usually make my favorite gluten-free blueberry-lemon muffins. But when I’m doing a detox or a cleanse, I need something a little different. 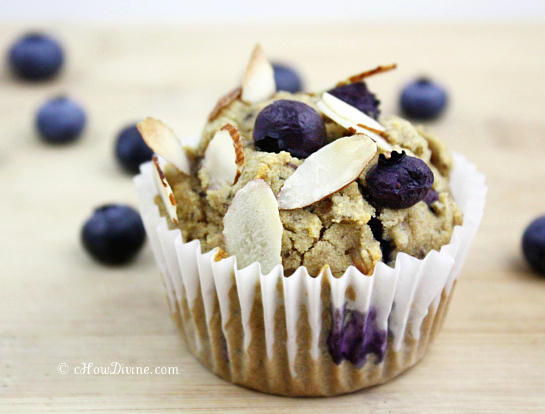 And these date-sweetened, gluten-free blueberry muffins are my go-to “detox” snack. These are truly guilt-free, so moist, and so tasty. I tend to overindulge quite a bit, simply because I just can’t say no to delicious food. So once in a while, I do a short detox or a cleanse. It’s nothing too severe. No liquid cleanse or fasting for me. I get way to cranky when I’m hungry. I just cut out animal products, processed foods, and added sweeteners. That’s all. I eat everything else that I normally eat. 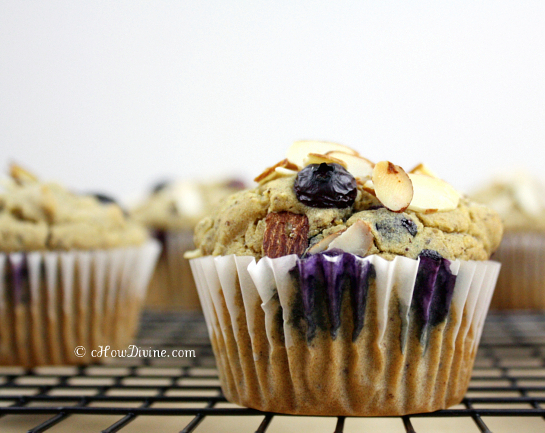 Keeping in line with my detox, these muffins are not only gluten-free, they are vegan. And ground flax seeds are added for their binding property as well as for their health benefits (omega 3, lignans, and fiber). Moreover, absolutely NO sugar is added: no granulated sugar, no honey, no maple syrup, and not even agave nectar. They are simply sweetened with puréed dates. However, if you prefer your muffins very sweet, you can add a SCANT amount of stevia. Stevia should not have a negative effect on your glucose levels unlike other sweeteners. I say “SHOULD not”, instead of “does not,” because I believe more research needs to be done for the finding to be conclusive. It has a reported glycemic index of zero. But be careful. It is up to 300 times sweeter than sugar. And if too much is added, your food will taste bitter. Additionally, make sure your stevia is pure and not cut with fillers like maltodextrin (it’s usually derived from rice, corn, or potato starch, but it can also be derived from barley or wheat). These muffins are great for breakfast. They also make a delicious and healthy snack for kids and adults alike! Preheat oven to 400 degrees. Prepare a muffin pan with liners. Place the dates in a small blender or processor. Pulse until the dates are finely chopped. 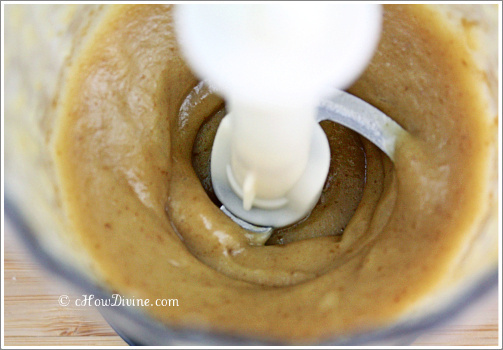 Add the applesauce to the dates and process or blend until the mixture turns into a smooth paste. Combine all of the wet ingrdients: mixture from step 1, almond/soy milk, lemon juice + zest, and vanilla extract. Add the ground seed to the wet ingredients. Mix well. Set aside. Whisk together brown rice flour, baking soda, baking powder, and salt. Add the wet ingredients from step two to the dry ingredients. Mix until the ingredients are just combined. Add the blueberries and almond slices. Stir gently. Using a ice cream or batter scoop, divide the batter into 6 muffins cups/liners. If you’d like, you can sprinkle some raw almond slices on top. Bake on the center rack for 22-25 minutes until a toothpick comes out clean. Rotate the muffin pan midway to ensure even baking. Remove from oven and allow the muffins to cool in the muffin tin for about 10-15 minutes. Transfer to a cooling rack and allow the muffins to cool completely. The muffins are yummier when they are allowed to cool completely. 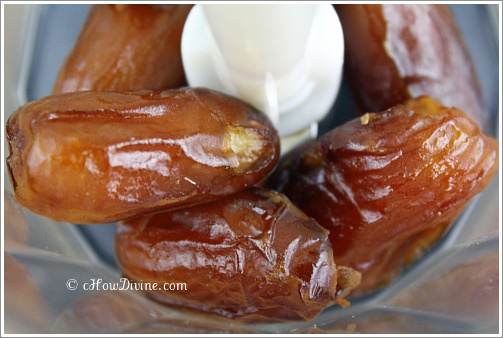 Once cooled, you can really taste the sweetness from the dates. They actually taste better the morning after! So enjoy them for breakfast the next day or as a tasty snack. They make great healthy snacks for kids too! *Cook’s Note: I am using Bob’s Red Mill Brown Rice Flour. Depending the the type of gluten-free flour, and even different brand of brown rice flour, you may need to adjust the liquid added. The batter should look like really soft, whipped butter. And it should settle nicely into the muffins cups when you give the muffin pan a gentle tap on the side. Additionally, don’t skimp on (or skip) the lemon juice and lemon zest!!! They make all the difference in brightening up the flavor. Lastly, don’t forget to keep the muffins in an airtight container or saran-wrapped if you are planning to enjoy them the day/morning after! I’m not much of sweet tooth either so these look like a great alternative to the sweeter types of muffins out there. Want to make muffins or cookies for a friend who is on a chocolate fast so this could be the recipe I was after :D. Thanks for sharing! You’re welcome Ames! I hope you and your friend like the muffins. But if your friend has super sweet tooth :-), you can adjust the sweetness with some stevia or even by replacing some of the almond milk with fruit juice. This recipe makes a great template for different preferences. Thanks for coming by the site! Thanks! I just finished baking another batch today. My husband who is neither a vegan nor the detoxing-type really liked these muffins. So I decided to bake a dozen. I’m trying my best to keep my husband from them until they cool. 🙂 As I mentioned in the post, don’t skimp on the lemon juice or the zest! These look great – and so healthy! Am definitely going to try them – Thank You! You’re welcome Vic! They are great at satisfying my carb cravings when I do a cleanse or a detox. But they are not as sweet as normal muffins. If you prefer your muffins sweet, add a little bit of stevia. They sound great. I want to try them but tapioca disagrees with me. Can you recommend a substitution for it? Thnaks! Hi Lynn! Thank you for coming by the site! I think potato starch might work well as a substitute, although I haven’t tried it with 100% potato starch. I usually do half tapioca and half potato when I bake. I just didn’t have any potato starch on hand when I made these. Give it a try. What kind of applesauce do you use? Do you have a homemade sugar-free recipe? Hi Zandi! I use store-bought unsweetened applesauce. I just make sure that it is organic and that apples are the ONLY ingredients. Trader Joe’s carries organic unsweetened applesauce at a reasonable price. Let me know if you have any other questions! Have you ever tried this recipe with a coconut flour or almond flour? I am trying to avoid grains. Thank you! 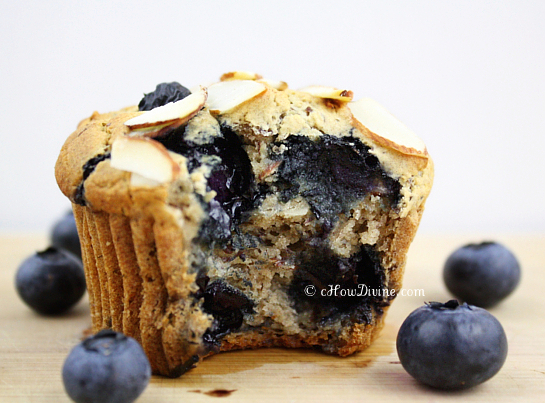 I do make blueberry muffins with almond flour. Here is a recipe for that. Hope this helps. Pingback: Baking Experiments. | Fit. Life. Mmmmm yum! These look wonderful! Thanks Cassie. Hope you give it a try. These muffins look so yummy. Can I use frozen blueberries for this recipe? Hi Yvonne, you can use frozen blueberries. Just dredge them with a tiny bit of flour mix to coat them before you mix them into the batter. The muffins really look great! I will definetely give it a try in the weekend. Just what is in the Cook’s Notes section. Gluten-free flours really differ from brand to brand, so you’d really need to pay attention of the consistency of the batter. Hope you enjoy! We usually finish them within the same day or the day after. So I don’t freeze these, but I surmise they would. Just make sure they are in an airtight container to prevent freezer burn. I have these muffins in the oven now and just wanted to thank you. I made them for my grand daughter who is allergic to eggs and for me and her mom who have gluten allergies. I did not have dates, so substituted them with prunes. The batter tasted yummy, so am hoping for the best! Also substituted the flax with chia. I hope you and your family enjoyed them once they came out of the oven. Thanks Sally!